The Marie Bridge, located in King’s County Prince Edward Island, is a bridge located over a small watercourse feeding the St. Peter’s Bay. The bridge is a single span structure of approximately 28 meters. The original design of the replacement structure required a phased construction process with the north half of the structure replaced first (with traffic maintained on the south half) and then traffic moved to the north half while the south half was replaced. 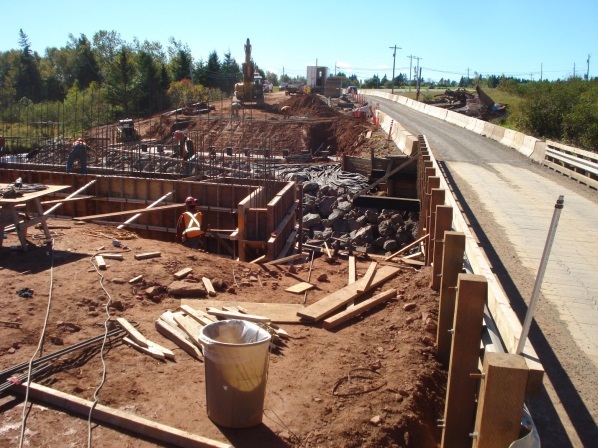 The bridge was to incorporate a cast-in-place deck on pre-stressed concrete girders (supplied by the Department of Transportation and Infrastructure Renewal PEI (TIR)) and semi-integral abutments founded on end bearing piles. Working with Highfield Construction, Harbourside Engineering Consultants (HEC) produced an alternate design for the new structure featuring integral abutments, reducing the total piling requirements by half. Also, in order to eliminate the time consuming phasing of the works, HEC designed a temporary detour bridge utilizing timber materials available through the TIR supply yard and detailed the detour alignment around the site. This enabled the work on the replacement structure to proceed without interference from traffic. The value engineering effort allowed the contractor to provide savings in the form of a rebate to TIR, pay for HEC engineering services and keep a portion of the savings for himself. The project (including the time for HEC to re-design the bridge and design the temporary structure) was completed on time in a very tight schedule and on budget.